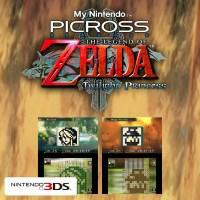 A downloadable Picross game for the 3DS themed on The Legend of Zelda: Twilight Princess . There are 45 puzzles that can be played as standard Picross or Mega Picross puzzles (with the order changed so you don’t know which is coming next when you redo the puzzles in the other mode) plus one Micross puzzle. Like the later PICROSS e titles, this presents a smooth and refined experience. Normal and Free rule sets can be switched between at any time, and the Hint Roulette, Hint-Number Auto-Check, and ? Navigation assist features can similarly be turned on or off at the player’s discretion. Having both buttons and stylus-based touchscreen makes the process of solving puzzles quite smooth. It’s also good that you can’t outright fail any of the puzzles, but if your time (including any penalties if playing a Normal puzzle) comes in under sixty minutes you get the bonus of having the black-and-white picture you’ve created rendered in color instead. Notably, this game is a My Nintendo exlusive that can only be bought with “platinum coins” earned by using that service. It’s not hard to earn the requisite number and there’s very little else worth spending them on, so despite the relatively small number of puzzles this is an easy purchase to recommend if you enjoy Picross and are willing to engage with My Nintendo. It’ll also help if you like The Legend of Zelda , since naturally all the images are from those games. Be advised that if this is your entry point to Picross games, it’ll be a bit difficult to go back to the earlier PICROSS e games should you be looking for more Picross, as they lack some of the polish that’s present here.